Brock Wingate puts his opponent in a hold during a match back in January. 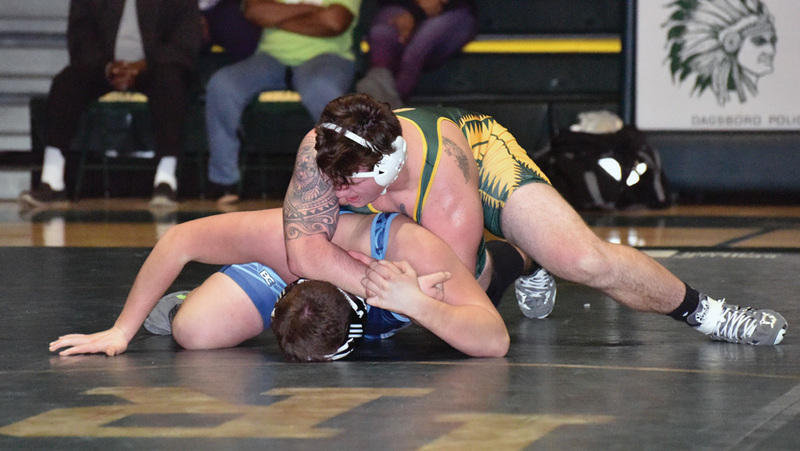 The Indians return seven state qualifiers from a year ago — of which three were state placers — from a team that finished 16-5 overall in dual meets, including a second-place finish in the Southern Division of the Henlopen Athletic Conference. Windish, who is coaching his 15th season overall at IR, will welcome 10 varsity starters back to the lineup, led by those three state medalists — junior Will Rayne (2nd), junior Ta’Jon Knight (3rd) and senior Zach Schultz (6th). The Indians will open the season next weekend, Dec. 7-8, at the Delmar Invitational. There, they will begin their preparations in their quest for the South Division crown that they came so close to last year. The lineup’s key returners include junior Chris Saylor (106), Rayne (113), sophomore Ian Shuabach (120), Knight (126), senior Dylan Ely (132), sophomore Michael Taylor (138), Turner (152), junior Will Keller (170), Schultz (195) and junior Ramond Turner (285). Rayne, Shaubach, Knight, Ely, Turner, Schultz and Turner were the seven state qualifiers from a year ago to whom Windish alluded as foundation pieces for this season. There is a very talented group of newcomers also looking to make their marks this season. Those include seniors Jake Grab (160) and Matt Zimmerman (182), juniors Cody Edwards (138), Josh Edwards (145) and Jose Perez (160), sophomores Colin Hudson (120) and Jalen Holland-Holloway (145), and freshmen Cole Windish (145), Dalton Hall (182) and T.J. Burke (220). Cole Windish and Hall both had impressive final seasons in the middle-school ranks, with Hall taking first place in the conference meet, while Windish took home third-place honors. The Indians will open their dual-meet season on the road with a battle against Laurel on Wednesday, Dec. 12, at 6 p.m. Two nights later, they will square off with another road tilt against Hodgson at 6 p.m. on Friday, Dec. 14. IR’s first home contest will take place right before the Christmas break, when they will host Woodbridge on Thursday, Dec. 20, at 3 p.m. It will be Teacher Appreciation Day at the match. Windish will be assisted this season by Jacob Miller, Steve Wilkinson, Phillip Townsend and Matt Selba.